Blankets, hats and mittens ñ not items that many people correlate with Arizona ñ but items that residents Orchard Pointe at Surprise know are needed in the cold winter evenings. Over the past year, a group of tenants at the assisted living community have met as a group, as well as in individual apartments, to work on projects that will benefit others. From mittens that are given to children on reservations, to making no-sew fleece blankets and hats for Friends Helping Friends, who serves the homeless in Phoenix, the Orchard Pointe seamstresses are focused on making an impact in the lives of people they will never see. Their latest project is teaming up with the American Heart Association for their project: Little Hats, Big Hearts, where residents will contribute to the 7,000 baby hats needed by February 2017. The group of quilters, knitters and crafters began with just a couple people, but as word spread throughout the retirement community, the increase has grown substantially. 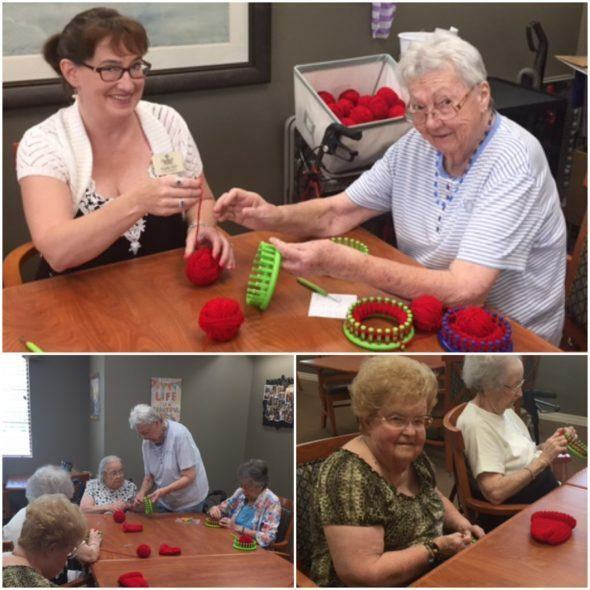 The loom knitters meet every Tuesday at 2:30pm in the Activity Room of Orchard Pointe at Surprise. So far 150 hats have been made and more are on their way. Orchard Pointe is located at 15048 W Young St in Surprise, AZ. The community offers 90 assisted living apartments and 16 memory support apartments. Orchard Pointe is a part of Heritage Communities, which owns and manages ten senior living communities, with two more currently under construction in Grand Island, NE and Glendale, AZ. For more information on Orchard Pointe please visit www.Heritage-Communities.com.